What is a benchmark assessment? A benchmark assessment is a series of texts that can be used to identify a student's current reading level and progress along a gradient of text levels over time. The word "benchmark" means a standard against which to measure something. The Fountas & Pinnell Benchmark Assessment Systems (BAS) evaluate student reading and comprehension ability with reliable and robust universal screening that is aligned to the Leveled Literacy Intervention System, and determine each child's instructional level for guided reading according to the Fountas & Pinnell Text Level Gradient™. 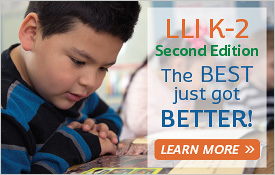 What are the major differences between Benchmark Assessment System, Second and Third Editions? New Comprehension Conversation Scoring Rubrics. The new rubrics enable more rigorous and consistent administration, analysis, and scoring. Revised Comprehension Conversation scoring. We have found that teachers need more guidance on how to conduct the Comprehension Conversation portion of the reading record. To provide this help, we have more clearly defined this process through the creation of a new rubric and have updated the scoring criteria. As a result, there will be more consistency and accuracy in scoring this portion of the assessment. Elimination of the extra point will bring greater consistency of scoring among teachers. Updates to the Assessment Guides, Recording Forms, Online Data Management System, and the Benchmark Assessment System Reading Record Apps. Enhanced digital delivery and elimination of physical CDs and DVDs. All Recording Forms, Summary Forms, optional assessments, and all NEW Professional Development Videos and Tutorial Videos are now available on Online Resources. In an effort to meet the changing technology landscape, we are eliminating the inclusion of any CDs or DVDs in the system. A unique product code, available on the inside front cover of each Third Edition Assessment Guide, will "unlock" the content in Online Resources. All new student and teacher video examples on the Professional Development Videos. Video examples are updated with all new content, including the new prompts and scoring for the comprehension conversation. Benchmark Assessment books revised for factual information in nonfiction and other minor changes in fiction and nonfiction. Why did the authors feel a change to the Comprehension Conversation section of the assessment was necessary? How were the new materials developed? At the bottom line, when you administer Benchmark Assessment, you are engaging in research. It is important in the process of research to have reliability. In other words, every teacher in your school needs to evaluate comprehension using the same precise criteria. If that is not the case, some teachers will accept superficial responses, while others will apply more rigorous criteria. We need to be rigorous. Otherwise, we will overestimate our students' ability to understand texts, and we will not provide the instruction required. If students are not deeply understanding the texts, we need to know that, and we need to help them. Assessment should provide this information to help teachers. We felt that teachers needed more guidance on how to conduct the comprehension conversation portion of the reading record. We cannot take for granted students' ability to deeply comprehend texts. It is not enough to read accurately with minimal literal comprehension. Students are expected to think deeply about texts. To provide this help, Fountas and Pinnell have more clearly defined this process through the creation of a new rubric and have updated the scoring criteria. As a result, there will be more consistency and accuracy in scoring this portion of the assessment. Elimination of the extra point will bring greater consistency of scoring among teachers. Can I use a mix of Benchmark Assessment materials from the Second and Third Editions? No. Changes have been made to both the Benchmark Assessment books and the Recording Forms. Using Second Edition books with Third Edition Recording Forms will not work because the text of the book and the text on the form will not always match, which will affect your ability to score a reader's accuracy. Why is it important for everyone in my school to use the same edition? Scoring has been refined. For example, new criteria for scoring the comprehension conversation has been defined and the extra point has been eliminated. Increased rigor in administration and analysis will result in more consistent scoring and determination of students' instructional and independent levels. As a result, assessing students with Benchmark Assessment System, Second Edition may result in slightly higher scores than peers assessed in Benchmark Assessment System, Third Edition. It is important to maintain consistency in assessment protocols within schools and districts and continue to assess with Benchmark Assessment System, Second Edition or convert to Benchmark Assessment System, Third Edition. While the more rigorous comprehension scoring will be reflected in the ODMS for Benchmark Assessment System, Third Edition, all student assessment data from all editions will continue to exist within the ODMS. How does the Fountas & Pinnell Benchmark Assessment System contribute to my knowledge of children and how they develop as readers? The comprehensive assessment procedures and the variety of tools and options provided in Benchmark Assessment Systems 1 and 2 are rich resources for helping you systematically examine a child's strengths and needs, helping you think about the important link between assessment and instruction. You will find detailed information about analyzing the reading behaviors of a child on an instructional-level text and tools for linking those behaviors to specific instructional goals in the Assessment Guide. The Fountas & Pinnell Literacy Continuum: Expanded Edition (Fountas and Pinnell, Heinemann 2017), included in every Benchmark Assessment System, is the foundation for instruction. You can make a direct link from the data gathered with the assessment to The Literacy Continuum's specific behaviors to notice, teach, and support in every instructional context related to literacy. The Professional Development Videos are another rich resource. They are designed to help you conduct efficient and effective assessments, learn how to interpret the results, and connect results to instruction. Over time, observations made through the assessment, instruction designed to move the child ahead from level to level, and follow-up assessment will deepen your understanding of literacy development. How is Benchmark Assessment a good use of instructional time? Unlike many traditional and computerized assessments, which are taken in isolation, Benchmark Assessment conferences give you a chance to spend quality time with each student. You will get to know your students and begin to develop relationships while you gather critical information. Students have the opportunity to read several books, think about them, and talk one-on-one with an adult about each text—and that is not time wasted. Students may do some writing about reading (an option), and that, too, not only provides valuable assessment information and is time well spent. Benchmark Assessment mirrors worthwhile literacy activities that are included in your instruction every day. What does the term "level" mean, and how are the levels in the F&P Text Level Gradient™ determined? The levels in the F&P Text Level Gradient™ refer to the difficulty of the books in relation to other books placed along a continuum from A–Z, easiest to hardest. We examine the characteristics of a book and place it along a gradient of books in relation to each other. A level designates the books as easier than the level after it (later in the alphabet) and harder than the level before it (earlier in the alphabet). We use ten characteristics to determine a level and the composite of characteristics contributes to its final designation: Genre/Form, Text Structure, Content, Themes and Ideas, Language and Literary Features, Sentence Complexity, Vocabulary, Words, Illustrations, and Book and Print Features. For a detailed explanation of each level, see Leveled Books, K–8 (Fountas and Pinnell 2006). Do the Benchmark Assessment levels match the guided reading levels? Yes. This assessment is specifically designed to match the guided reading levels described in Leveled Books, K–8 (Fountas and Pinnell 2006), Guided Reading: Responsive Teaching Across the Grades (Fountas and Pinnell 2016) and other publications by Fountas and Pinnell. How can I use this system to match books leveled with other systems? 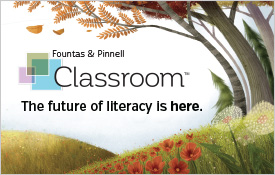 Fountas and Pinnell have leveled over 53,000 books, many of which appear in the Fountas & Pinnell Leveled Books List, K–8+ (Fountas and Pinnell 2009) and all of which appear on the Fountas & Pinnell Leveled Books Website (www.fandpleveledbooks.com), which is regularly updated. Also, many publishers place several different kinds of levels on books and/or offer correlation charts. You can also use the Benchmark Assessment books as models or prototypes to help you level other books. How does the Fountas & Pinnell Benchmark Assessment System compare to DRA or Rigby PM Ultra? This equivalence chart, published in the Benchmark Assessment System Guides and Leveled Literacy Intervention System Guides, includes grade level, Fountas & Pinnell level, basal level, Reading Recovery level, Rigby PM level and DRA2 level. Many publishers provide correlation charts to connect their assessment systems with the Fountas & Pinnell levels identified by using the Benchmark Assessment System. We would like to set level goals for our students at each grade. What would you suggest? It is not possible for us to predict where your students should be, as it depends on many factors. However, we do provide some guidance tools in the Assessment Guide. You may also refer to the F&P Text Level Gradient™ and The Fountas & Pinnell Literacy Continuum, included in the Benchmark Assessment System box, for specific behaviors to notice, teach, and support. How does Benchmark Assessment help me with my leveled book program? Benchmark Assessment is designed to help you collect reliable evidence of student competencies and reading levels so you can begin your teaching where the learners are—at the optimal instructional level and with in-depth knowledge of their reading behaviors—bringing all readers forward in their competencies. No other assessment has been directly linked to the F&P Text Level Gradient™ to date, so you will also have a reliable and valid assessment to link to guided reading, small-group reading instruction. How often should the Benchmark Assessment be administered? We suggest that you administer the assessment at the beginning of the year to help you determine where to start your teaching with each child. You may also want to conduct the assessment in the middle of the year, to take stock of progress, though you may already have the information from your ongoing use of reading records in instruction. Finally, near the end of the year you may want to conduct one more assessment to obtain a final record of the child's growth across the year. You may decide to administer the last assessment a couple of months before the end of the year. In this case, the assessment can provide information for instruction during the last months of school, while avoiding the redundancy of testing at the very end of one year and the beginning of the next. How long does it take to administer the assessment to a student? At the earliest levels, a full assessment conference may take 20–30 minutes. At the upper levels, where the texts are longer and the conversations more substantive, it may take 30-40 minutes, but as you gain experience, the time will be shorter. Remember that the longer books have a stopping point for oral reading. Also, fluency makes a difference. In this guide, we make several suggestions for how to make efficient use of your time. Remember that each student has had a chance for one-on-one time reading and talking with the teacher. How do you know at which level to start a Benchmark Assessment so as to make the administration as time efficient as possible? We provide several time-saving options. If you have no information on a child's previous reading performance, the Where-to-Start Word Test provides a rough starting level for assessment and will cut down the number of books he needs to read before you can identify an independent and an instructional level. If you do have information about a child's previous reading performance and/or know something about the texts he is reading, the Assessment Guides provide correlation charts to help you determine the best starting point. How can I ensure that I am conducting the assessment in a standardized manner? The precise steps of the assessment conference are described in the Assessment Guides and are systematically presented on the Recording Form for each book. Remember to keep your own language spare and to avoid teaching or leading the student to answers. The introduction to each Benchmark Assessment book is standardized and printed on the cover as well as on the Recording Form. The steps for administration, scoring, and analysis are all standardized and explained in detail in the Assessment Guides. In addition, the tools supporting the assessment, such as the F&P Calculator/ Stopwatch, the Coding and Scoring at-a-Glance chart, and the comprehension conversation rubrics, provide an easy way to maintain consistency across assessments and help you internalize the steps in the process. Furthermore, the Professional Development Videos provide clear examples and plenty of practice opportunities for developing precision and consistency throughout assessment conferences. Why does Benchmark Assessment use a comprehension conversation instead of comprehension questions? We have found that a comprehension conversation is the most effective way to collect the best evidence of comprehension because you can paraphrase questions and probe further for student understanding. How does Benchmark Assessment support my ability to conduct assessment conferences with children whose first language is not English? The Assessment Guide provides specific support to help you understand how language differences should be noticed in the administration and interpretation of the assessment. In addition, the Assessment Guide includes case studies of English language learners, providing real-life situations for you to think about and learn from. How will I know how the results from the Benchmark Assessment relate to the standards for grade-level performance in our district? Your school or district should make decisions about expected grade-level standards, taking into account your state's goals. You can refer to the Instructional Level Expectations outlined in the Assessment Guide for suggested indicators, but adjust them if you have rationales for a different standard. My district uses Lexile measures to place students. How will I know the results from Benchmark Assessment match the Lexile levels? There are several approaches to determining a text's level of complexity. Metametrics, the company that provides Lexile measures, takes one approach by measuring text complexity with a proprietary computer algorithm that measures sentence length, syllables, and word frequency. The levels in the F&P Text Level Gradient™ are based on ten text factors: Genre/Form, Text Structure, Content, Themes and Ideas, Language and Literary Features, Sentence Complexity, Vocabulary, Words, Illustrations, and Book and Print Features. A level obtained from a Benchmark Assessment differs from that obtained with a Lexile assessment in that comprehension is a key factor in the Benchmark Assessment. A student might very well be able to decode high-level texts, but a Benchmark Assessment also determines if the student's comprehension is good enough for instruction. How can I pass information along to ensure that my students' literacy growth will be documented across the years? You will find a variety of tools in the Benchmark Assessment System to support the documentation of a student growth over time, as well as ways to track development of groups and classes. Student folders (included in each system box) provide a longitudinal graph for teachers to record progress. The folders are designed to be passed from teacher to teacher and hold the assessment information on one student from kindergarten to grade 8. The Online Data Management System (ODMS) provides several options for reports on individuals or classes in chart or graph format. The ODMS provides expanded tracking and reporting capabilities for both teachers and administrators in an online format. More information on the ODMS is available on the Heinemann website. How can we use Benchmark Assessment data to improve our school? Have regular faculty meetings to examine the data within and across grade levels. Look at the general reading levels of the age cohort, but don't stop there. Use the case studies in Section 5 of the Assessment Guide to help you think about priorities for teaching students. Think across the language and literacy framework. You can teach comprehension through interactive read-aloud, minilessons, guided reading, and literature discussion. 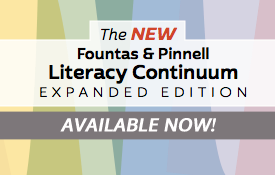 The Fountas & Pinnell Literacy Continuum, Expanded Edition (included in your Benchmark Assessment System, Third Edition purchase) can also be used to identify teaching goals. Is there a digital alternative to taking the reading record on paper? Yes. The Benchmark Assessment System Reading Record App (RRA) allows teachers to conduct assessments on their iPads instead of using the printed Recording Forms. Use of the RRA requires an in-app purchase. Search for "Fountas and Pinnell" in the Apple iTunes store. If you did not find an answer to your question in these Frequently Asked Questions, please check the Discussion Boards for additional answers or to post your question to Fountas and Pinnell Trained Consultants and to other users like you.